TORONTO, ONTARIO--(Marketwire - Dec. 9, 2009) - Vena Resources Inc. ("Vena" or the "Company") (TSX:VEM)(LIMA:VEM)(FRANKFURT:V1R) is pleased to announce that it has signed a definitive Joint venture agreement with Gold Fields, the third largest gold producer in the world, to create a new Peruvian company "NewCo" to jointly explore the Esquilache regional project 100% owned by Vena in southern Peru. "NewCo" rights will not include the historical San Antonio de Esquilache gold/silver mine that is currently undergoing a 3,000 meter drill program. Under the terms of the joint venture, Gold Fields can earn an initial 51% interest in "NewCo" by spending US$1.5 million on exploration and maintenance within three years of the effective date of the joint venture agreement. Gold Fields can earn an additional 19% interest in "NewCo" by spending an additional US$3 million on exploration and maintenance within the subsequent three year period to bring its total interest to 70%. If Gold Fields does not complete the additional investment of US$3 million, its interest in "NewCo" will remain at 51%. Further development of the project would be subject to normal straight line dilution clauses. Should either party dilute to below 15%, then it would exit with a 1% NSR. The "NewCo" owner would have the right to purchase one-half (or 0.5%) of this NSR interest for US$2 million. Gold Fields will be the initial operator and full pre-emptive rights will apply in the case that either party wishes to assign or sell its interest in the joint venture or its rights to the NSR royalty to an unrelated party. The parties have agreed that NewCo's Management Committee will be comprised of two representatives of Vena Resources and two representatives of Gold Fields with Gold Fields having the casting vote. Gold Fields is one of the world's largest unhedged producers of gold with attributable production of 3.6 million ounces(1) per annum from nine operating mines in South Africa, Ghana, Australia and Peru. Gold Fields also has an extensive growth pipeline with both greenfields and near mine exploration projects at various stages of development. Gold Fields has total attributable mineral reserves of 81 million ounces and mineral resources of 271 million ounces. (1) Based on the annualized run rate for the first quarter of fiscal 2010. "We welcome Gold Fields to the Esquilache region. Vena is very focused on drilling the historical Esquilache gold/silver mine while working with Gold Fields to explore the early-stage areas surrounding the historical mine. Access to geological knowledge and global expertise is what Vena looks for in any partnership. 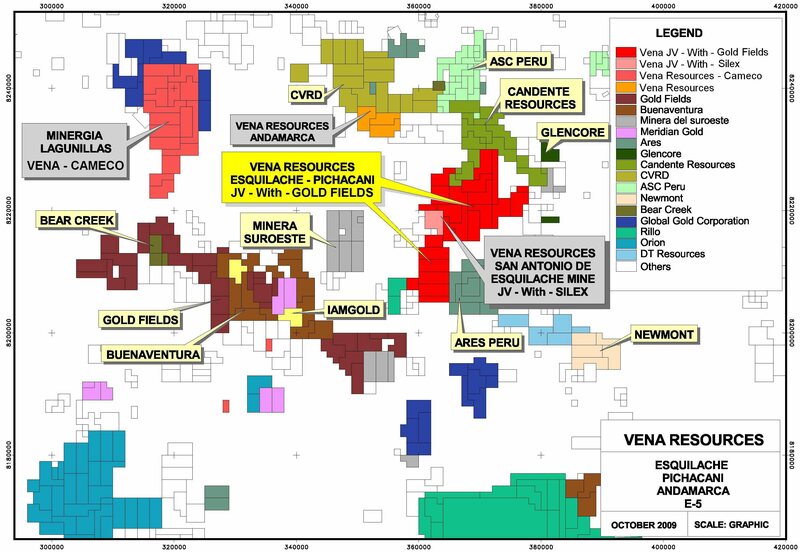 Gold Fields is the third global mining company that Vena has entered into a joint venture agreement with - the others being Cameco in Uranium and Glencore in Zinc."